A view taken from Odiham Wharf bridge, 2012. 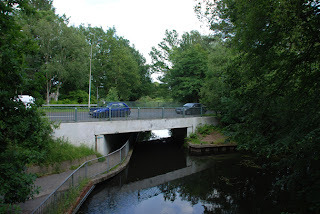 It was late June in 2012 that my wife and I made a visit to the Basingstoke Canal to see how it has developed since its restoration. 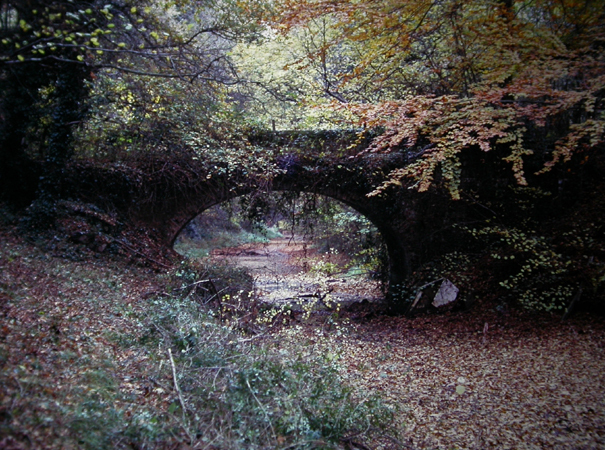 Repeats of photographs that had been taken in the 1970s were taken from the same position. Although one or two narrow boats were seen, not a single craft was observed actually using the canal, there was one person fishing. This underlines my opinion that following restoration, the Canal is neither one thing nor the other. It is not a major recreation resource, nor does much of the rich wildlife present in the 1970s survive. 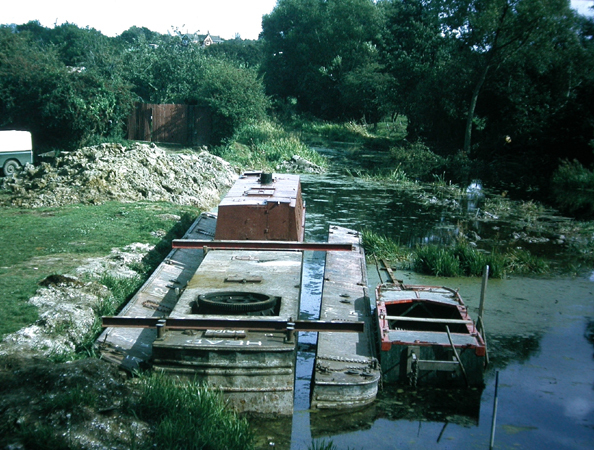 As will be seen from comparison of the photographs, very little wildlife survives at all, and the current canal landscape is very similar to that of any of Britain’s other waterways. 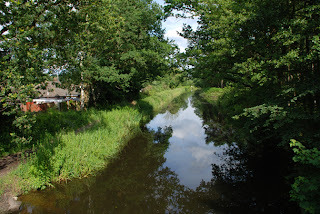 As in the photograph shown in my previous blog of the Kennet and Avon Canal, the water is opaque and brown. No one in their right mind would contemplate drawing a pint of Basingstoke Canal water and downing it today. 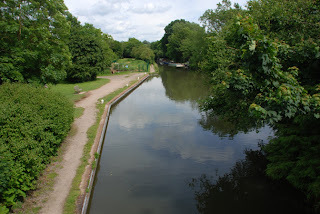 At Crookham Wharf, I recorded part of a notice board displaying aspects of the Canal. The following is a quotation from that notice. Britain’s largest bat hibernation site. 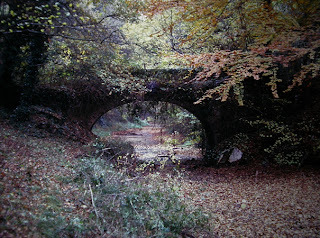 A view looking east from Pondtail Bridge in Fleet in 1975.
taken in June 2012. Note the total lack of any surface vegetation. Looking at the Canal and its wildlife today, it is certainly neither teeming with wildlife, nor does it support a huge variety of dragonflies. The biodiversity of plant life is very low. Having written it personally way back in the 1970s, I believe the quotation was taken originally from the label for the Willis Museum, Basingstoke display portraying the Canal. In those days, this statement would have been true. The claim that the Greywell Tunnel is the largest bat roosting site in Britain is huge, but if this is so, it underlines how important the Canal was for wildlife in the past. During the visit my wife and I made to the Canal recently, I saw neither damsel nor dragonflies, even though this should be the height of the flying season for them. The weather on the day was bright and sunny, ideal for dragonflies to be hunting actively. I spotted no surface vegetation whatsoever, and just two birds that could be considered as being associated with it. These were a moorhen and a drake mallard, both species that can tolerate moderate disturbance and a less than pristine aquatic environment. 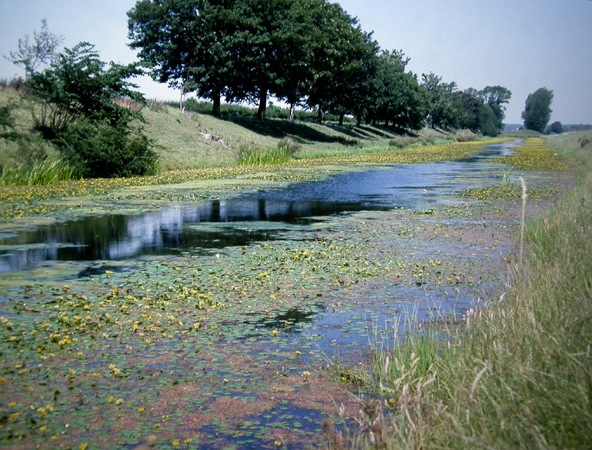 The Royal Military Canal to the west of Hythe in Kent. yellow flowered species is Nymphoides peltata. 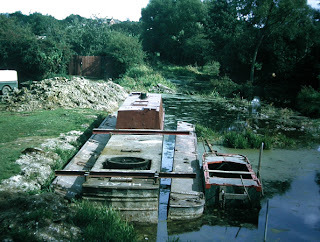 In the 1990s, I visited the Royal Military Canal near Hythe in Kent. 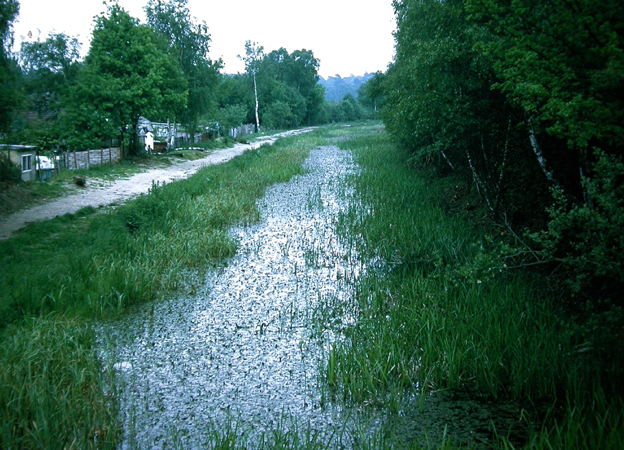 This waterway was built as a defensive measure and was finished in 1804. Since then it has developed a rich flora and fauna and is a candidate site to rival the ecological richness that was once the Basingstoke Canal. Aquatic sites such as the Basingstoke Canal are in short supply, and if any as rich as the Basingstoke Canal do survive, the ecological importance that they represent should be valued, and taken into account strongly when any conservation or restoration plans are put forward.